Maestro SERGIU NATRA is a classical music composer of great international reputation and is one of the most qualitative and important classical composer worldwide in the 20 – 21 centuries. Works of his were defined as “ingenious“, “masterpiece”, “brilliant”, "monumental", "highest level of universal musical creation", “the greatest pieces ever written for the harp”. An unusually heavy and unprecedented snow and severe floods almost paralyzed Israel in February but did not dim the fine playing of the three finalists of the 11th International Harp Contest, who played with the Israel Philharmonic Orchestra to an almost full house. 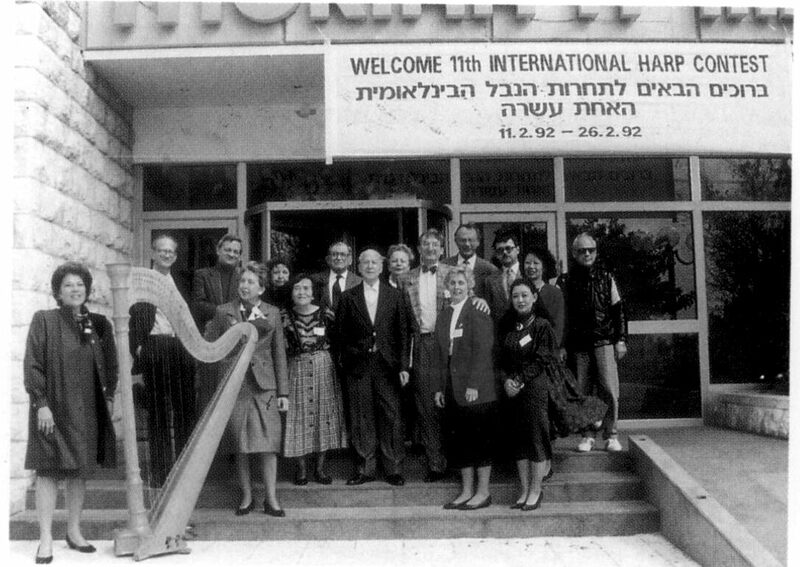 Thirty-six harpists from 16 countries (France, USA, Poland, Russia, Japan, Austria, Yugoslavia, Turkey, Germany, Taiwan, Canada, Denmark, Switzerland, Czechoslovakia, South Korea and Israel) began in the First Stage; sixteen contestants continued to the Second Stage. The Pearl Chertok Prize for playing the required Israeli composition (by Avni, Braun, Shidlovsky or Tal) was awarded in the First Stage to Mariko Anraku of Japan, who played the work by Zvi Avni. All four works had been commissioned by the Contest. The Gulbenkian Prize for playing a Contemporary work in the Second Stage (Britten, Casella or Krenek) was given to Marie-Pierre Langlamet, who played Britten. Six contestants made it to the Semi-Final Stage, in which everyone played Sergiu Natra’s Music for Violin and Harp with Lazar Schuster, Concertmaster of the Israel Philharmonic Orchestra, an then p ayed a 40 minute free choice recital. At the end of this stage, three harpists were chosen for the Final Stage and the Fourth Prize (The Rosalind Weindling Prize) was awarded to Xavier de Maistre of France. The three finalists played Debussy’s Danse sacree et Danse profane and Saint-Saens Morceau de concert with the Israel Philharmonic Orchestra, Mendi Rodan conducting. The Jury then decided that the First Prize (a Lyon & Healy harp) would go to Marie-Pierre Langlamet of France, who presently plays at the Metropolitan Opera in New York. The Second Prize (The Rosenbloom Prize of $5,000) was awarded to Jana Bouskova of Czechoslovakia and the Third Prize (A. Z. & Mara Propes Prize of $5,000) to Mariko Anraku of Japan. The Prize-Awarding Ceremony at the Residence of the President of Israel was cancelled because of the heavy snow in Jerusalem and took place at 21 Tel Aviv Hotel. The diplomatic representatives of Czechoslovakia, France and Japan attended. The very exciting and festive Opening Concert of the Contest took place in the Jerusalem Theatre. The President of Israel, Chaim Herzog, greeted the participants and the Jury. The Ambassadors of the participating contestants’ countries were present. Nicanor Zabaleta, a Guest of Honor of the Contest, gave a short recital and was followed by Isabelle Moretti of France, winner of the previous Contest in 1988, who gave a full recital. The International Jury of this Contest consisted of the following: Yahli Wagman, Judith Liber and Sergiu Natra of Israel, Kathleen Bride and Grace Wong of the USA, Pierick Houdy of Canada, Bertile Fournier of France, Franz Muller-Heuser from Germany, Ion Ivan-Roncea of Rumania, David Watkins of England, Ayako Shinozaki of Japan and Vera Dulova of Russia. The contestants, the members of the Jury and the Guests of Honor had an opportunity to tour the Old City of Jerusalem, the Holocaust Memorial and the Israel Museum. The general public and the media took great interest in the Contest. In spite of the bad weather the various stages of the Contest were very well attended. Nicanor Zabaleta gave a Master Class at the Jerusalem Music Center before the Contest.